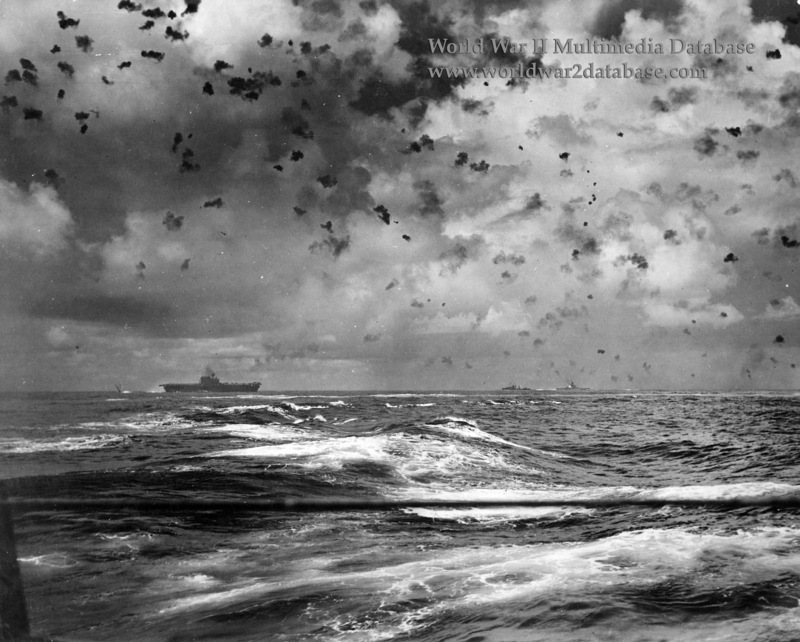 U.S. Navy ships firing at attacking Japanese carrier aircraft during the battle, October 26, 1942. USS Enterprise (CV-6) is at left, with at least two enemy planes visible overhead. In the right center is USS South Dakota (BB-57), firing her starboard 5-inch (127-millimeter) secondary battery, as marked by the bright flash amidships. After an erroneous report that the Japanese Imperial Army had captured Henderson Field on Guadalcanal, the Combined Fleet came to sweep the Solomons clear of American naval forces. After Enterprise Douglas SBD Dauntless diver bombers severely crippled IJN Zuiho, Japanese Nakajima B5N2 (Allied code name "Kate") torpedo bombers and Aichi D3A type 99 (Allied code name "Val") dive bombers stopped USS Hornet (CV-8) at 1020 Hours with two torpedo hits, two suicide hits, and four bombs. She was so badly damaged that she was abandoned; American scuttling attempts failed, and she was later sunk by the Japanese. Hornet's planes damaged IJN Chikuma and IJN Shokaku. At 1115, Enterprise herself came under attack. Three bombs blew an SBD, with a crewman, overboard and holed the flight deck, destroyed eight aircraft, and killed forty men; fires started below decks. At 1144 a second attack was unsuccessful in hitting Enterprise, but damaged USS Smith (DD-378), impacting her forecastle and killing twenty-three. Two other attacks damaged South Dakota but also failed to stop Enterprise. The carrier, listing, made frantic turns to avoid torpedoes and bombs, and South Dakota stayed with her. The firepower of the new 40mm Bofors antiaircraft guns and white-knuckle seamanship probably saved Enterprise from being sunk or even more seriously damaged.